Sister Marie Imelda was a true innovator in children’s education. Sister came to St. Giles in 1937 to begin our kindergarten. Her love was clearly reflected in her innovative teaching methods and carefully designed classroom. Sister Marie Imelda’s unique teaching technique, an adapted Montessori method, gave St. Giles a special kindergarten. She was the editor of “Little Mine” children’s magazine for fifteen years. She founded the National Catholic Kindergarten Association and was its first President. Sister was also a consultant in the establishment of kindergarten programs in both public and parochial schools throughout the United States. 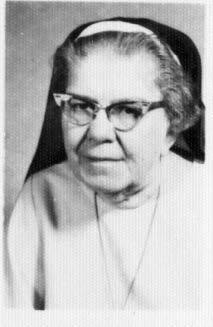 Sister Marie Imelda retired from St. Giles in 1976 and died at the age of 85 on September 8, 1991, at St. Dominic Villa in Dubuque, Iowa. The Giving Society has been named in her honor. Maintaining a high quality school today is increasingly expensive. We are grateful to our major donors, who understand the need for consistent support to cover the growing costs of employee benefits, maintenance and continuous enhancements in curriculum and technology. Society donors make cumulative annual donations of $1,000 or more to help us continue the legacy of Catholic education. ✤ Recognition in newsletters, the annual report and the St. Giles Arrow. ✤ Mass intentions remembered at the November Mass of Remembrance. ✤ Invitation to the annual Society Reception. ✤ Priority seating at the St. Giles School Christmas program. ✤ St. Giles School logo gift each year at Christmas. ✤ Sponsorship of a classroom of your choice for a trimester with signage. ✤ Annual Mass in the School Chapel. ✤ Complimentary tickets to the annual Black & Gold Pride. ✤ Sponsorship of a classroom of your choice for the school year with signage. ✤ Private Sunday brunch in the Rectory with our Pastor and Principal. * Cumulative gifts include donations to the Margaret Stewart Tuition Assistance Fund or any of the following fundraisers: Lion’s Leap, Black & Gold Pride Paddle Raise, Annual Fund, Sister Marie Imelda Society and other occasional fundraising campaigns.